Luna came to Fixed Fur Life as an owner surrender. Her owner could no longer care for. She has been with us for many months. She was Spayed by Fixed Fur Life and has now been adopted out. 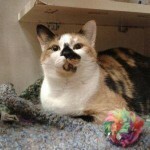 Mia is a 2 year old Calico whose owner could no longer care for her. She has been Spayed by Fixed Fur Life. Sylvester was an abandoned kitten. He has now been adopted! 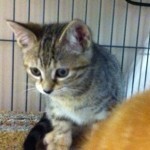 December 2013 - Huckleberry is a very curious and active little girl who was brought to Fixed Fur Life after being found outdoors as an abandoned kitten with her brother Finn. Both had so many fleas we thought they would carry them off in the night. 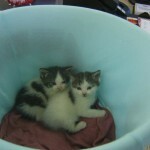 Both were treated for their infestations and have now been adopted out together! 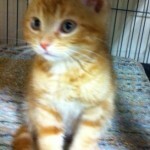 December 2013 - Finn is a very cuddly little boy who was brought to Fixed Fur Life after being found outdoors as an abandoned kitten with his sister Huckleberry. Both had so many fleas we thought they would carry them off in the night. 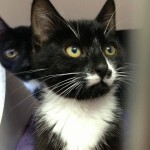 Both were treated for their infestations and have now been adopted out together! 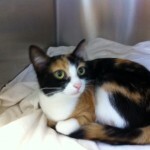 Mable was a stray female. Her baby making days are over. Was Spayed by Fixed Fur Life and as a result was adopted! Shown here lounging in new home! These 2 siblings were rescued from under a trailer in the cold wet rain along with mom and 6 others. They were adopted together last evening! Trooper and Hannahs mom was hit by a car when she was pregnant. They are the only 2 kittens that survived. Trooper was born with non functioning back legs one of which had to be amputated. He does not know that he is disabled. He runs, Plays and uses the litter box like any normal kitty. He must be adopted with his sister Hannah as they cry for each other if one is out of sight. 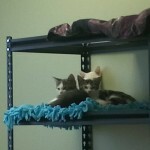 Both have been Spayed and Neutered and adopted! 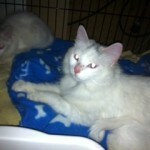 Visit their journey on Facebook"
Casper’s mother was a pregnant stray. He was Neutered by Fixed Fur Life. A very shy boy and as a result he was often overlooked. He was finally adopted out! 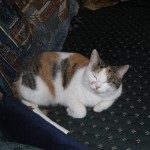 21 Nov 2013 - Ellie is a 5 year old female Spayed Calico whose owner left the country and could not take her with them. 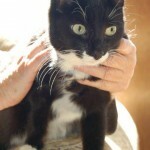 She is a lovely cat and very affectionate with people but would prefer to be an only child! I was adopted! 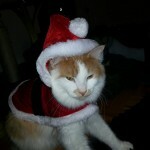 Scotty Update - Here is Scotty, an FFL alumni! 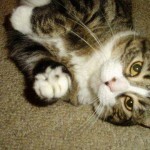 I adopted him years ago... It was love at first sight! The poor guy had been running around downtown Trenton as a kitten and from what I understand had been in and out of homes for a year or so. The family who took him before I did only had him a day or so; they brought him back because he pee'd on their floor... they didn't realize how... skittish he was, and they had small children. I took him into a quiet home with no kids and one other cat. It was a few weeks before he stopped hiding all day, but over time he blossomed into a great addition to the family He didn't enjoy a baby being brought into his house 4 years ago, and probably won't like this one in a few weeks any better, but he'll adjust. He's turned into quiet a porker! He loves cuddles and treats. He also thinks he's a dog, complete with tail wagging and drooling when he gets a good purr going. 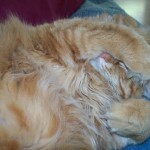 Thank you, FFL for choosing us to bring Scotty into our family. 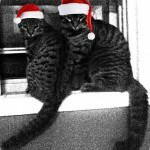 Two of our Fixed Fur Life Alumni getting ready for the Christmas season. Were adopted together and are doing well. Thank you to the Esterbrooks for the update. 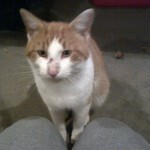 Georgie was an outdoor Stray with zero chip or identification. 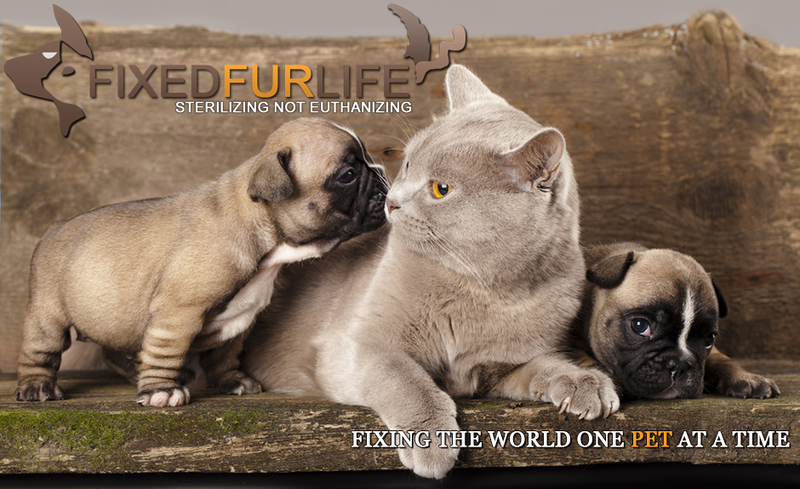 Here is a note from his new family - After directly going through what it takes to re-home a stray (neuter, vaccinations, etc) it is an extremely expensive process to make sure these little guys get a second chance. So thankful to Fixed Furlife for making this possible!! If you are able to help this wonderful not-for-profit out with a cash donation of any amount it would be greatly appreciated. Georgie thanks you! Mr Cattington and Clawdia in their new home getting ready for Christmas! Mr Cattington and Clawdia were living outdoors. Appear to be siblings. Shown here cuddling on a chair outdoors. 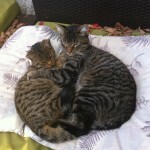 They were fixed through FFL and then were adopted together. 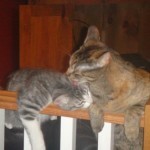 Willow and Silly Billly were 2 strays. Spayed and Neutered and Adopted! Sammy’s mom was taken in as a pregnant stray. Shown here in his new home. 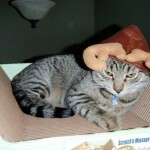 Bailey was taken in as a stray taken in by FFL. Covered in grease and grime and badly matted. 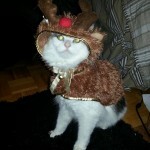 He was Neutered and adopted. Hank and Hannah were found in a dumpster at just 5 weeks old . Brought to FFL. They were later adopted together and have both been Spayed and Neutered.